According to David Bradley of Westside International, in the fight against the problems caused by damp, a radical new approach to humidity problems was needed and Rosahl has come up with a near perfect solution for air drying and dehumidification problems in enclosures a membrane dehumidifier. 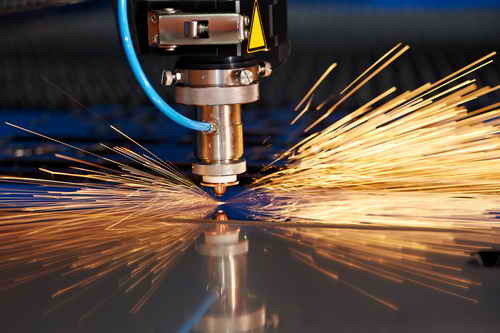 Moisture and humidity can be a problem for engineers developing sensitive electro optical devices, lasers, LED systems and some Piezo devices. Inside cabinets, buildings or simple storage areas, moisture ingress costs millions each year in damage and preventative methods. Traditional dehumidifying solutions are beset with problems, such as size, weight, noise, and high power consumption: maintenance is also a significant factor including bacteria removal, emptying collection tanks, replacing worn out parts and recycling desiccant (gel) packs. 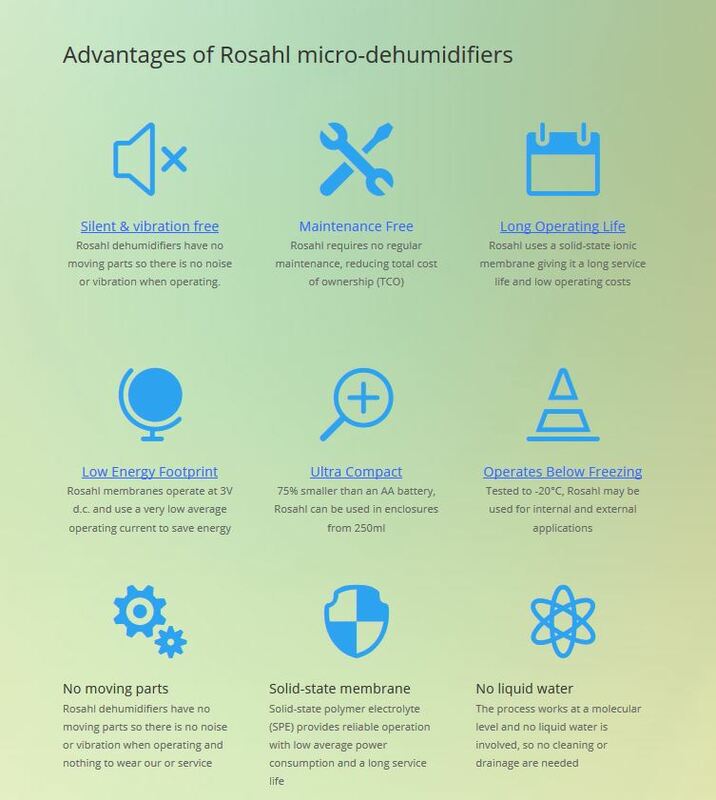 With Rosahl membrane dehumidifiers these problems are removed. Rosahl is extremely light and compact; requires no emptying; is silent in operation, uses little power, and has no moving parts to wear out or cause vibration. This unique product literally removes moisture from an enclosed area (such as a cabinet) by transferring it through the unique membrane and discharging it to the outside. Electrolysis provides new approach to humidity problems through the application of an ionic membrane dehumidifier. The core component is a solid state electrolyte polymer membrane. This special membrane has a porous inner side which attracts moisture when a 3V DC electrical charge is applied. The moisture is then absorbed into the membrane, where it is decomposed into the chemical elements of water (H2O) into hydrogen and oxygen ions. The hydrogen ions are then passed through to the other side of the membrane where they recombine with oxygen to be discharged into the air as water vapour. ROSAHL products are extremely flexible can be used in a wide variety of dehumidification applications, ranging from sterile cabinets through to challenging external environments such as externally housed traffic control cabinets. 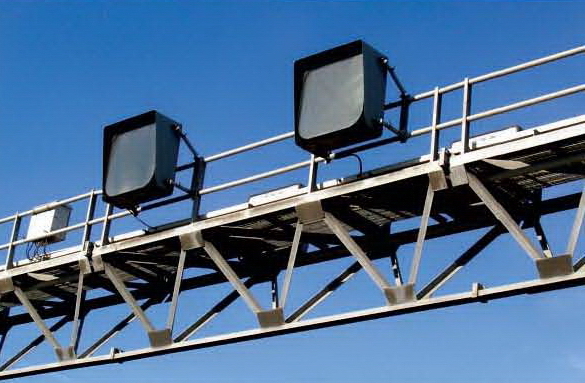 It is ideal for remote or hard to access equipment. The moisture extraction rate of ROSAHL products is relatively low and they are designed for use in steady state (enclosed) environments. They are best used in enclosed areas of up to 8 cubic metres (280 cu ft). Since ROSAHL products use very little energy compared to other types of electrical humidifier, they can be left to run 24hours a day, 365 days a year continuously extracting moisture from an enclosed area without incurring major energy costs. In fact, since they need no emptying they can be left just to get on with the job for years without any worries. Having high relative humidity can affect many things such as electronic products, whose working characteristics can change dramatically with humidity. Corrosion of metals can occur mainly when humidity is over 50%. Reduce humidity to less than 50% and corrosion of metals is drastically reduced. Bacteria (which causes smells and can damage goods) needs humidity over 50% to survive and multiply. Mould and fungi need a relative high humidity of over 70% to flourish; keep the relative humidity less than 50% for more than 95% of the time will help prevent any organic growth. Typically, the ROSAHL product range can extract up to 58 grams of moisture a day in spaces up to 4 cubic metres and for this the average annual power consumption is just 20 Watts. Their compact size of 24x30x5.5mm for the smallest self-contained unit up to 163 x 155 x 13mm for the largest module makes them suitable for the smallest of areas. With its zero maintenance, environmentally friendly construction, and low energy usage the ROSAHL product range is proving time and again why it is modern choice for most contained moisture problems. For further information on this revolutionary approach to humidity problems please contact us.